The MG 6 mid-class hatchback, equipped with a 1.8-liter turbo engine, will be produced by SAIC Motor Passenger Vehicle Co in a plant in Lingang. “There will be market potential for the MG 6 if SAIC prices the car competitively,” said Ye Sheng, an auto analyst at automotive consulting firm, B. Thinking Management, in Shanghai. The nation’s biggest car maker will also start production of the MG 6 in a plant in the United Kingdom next year as it tries to revive the 85-year history of the British icon globally. It said the MG 6, which debuted at the Shanghai auto show in April, is specifically designed for Asian and European markets. 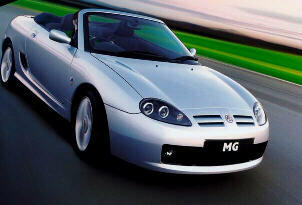 SAIC has operated the sporty MG brand as its own since the car maker acquired smaller domestic rival Nanjing Auto at the end of 2007. SAIC now produces the MG 7, MG 3SW and MG TF sports car in China as well as the Roewe series that came from the Rover Group of the UK. Despite its western pedigree, MG remains first and foremost a brand focused on the Chinese market first and overseas markets second, and if it can assuage western concerns about product safety and quality upon its British launch next year, it could give Chinese (or at least Chinese-owned) car companies a much-needed PR boost. Do you recall the story of Rip Van Winkle? Lovable but lazy bloke falls into dubious company, gets drunk and sleeps for several years. Returns to find the world much changed, his friends long gone. Resumes a life of idleness and eventually dies of old age. We can only hope that the fate of Britain’s most popular sports car is more inspirational. 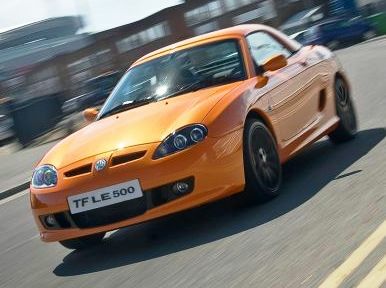 Thirteen years have passed since the car you see here made its debut as the MGF, the first genuinely new model from the venerable MG marque since the demise of the MGB GT in 1980, although it was another seven years before the MGF was transformed into a sports car worthy of the brand’s sporting heritage. Sadly the revised TF lived only three years before the collapse of MG Rover, the rump of a once-great industry abused by British governments, trade unions and management, picked up and discarded by BMW and preyed upon by vulture capitalists before the bones were thrown to the Nanjing Automobile Company (NAC) and the Shanghai Automobile Industry Corporation (SAIC). Now, after a hiatus of three years, the MGTF is back in production. But the world has changed a great deal in that time. What hope can there be for what is basically a 13-year old car (albeit revised) from an 84-year old marque that once epitomised a British tradition and is now owned by the Chinese? As a nation we might now be more cynical than complacent, but let’s not rush to judgement before we’ve covered a few miles on what the revitalised MG concern describes hopefully as “a new journey”. First, the corporate status of the marque needs some explanation. MG and MG Rover’s Longbridge factory were originally acquired by NAC, which among its other activities can claim to be China’s oldest car maker. In a recent deal brokered by the Chinese government (signed off on April 8), NAC’s automotive sector (including Longbridge) was acquired by SAIC, China’s biggest vehicle manufacturer and the owner of Rover (or Roewe as it is called there); in addition SAIC owns a 51 per cent stake in SsangYong and is involved in joint ventures with General Motors and Volkswagen. It has worked with Shoreham-based Ricardo to develop new cars, and established the Shanghai Motor Technical Centre (SMTC UK) at Leamington Spa (plus a design studio at Coventry) to provide engineering and design skills for both MG and Roewe; the “new” MGTF was re-engineered here and chief designer Tony Williams (who previously worked under Peter Stevens) and his colleagues are now working on a range of forthcoming MG and Roewe models, pending their move later this year to a new facility at Longbridge, which will also be the headquarters for R&D, marketing, sales, distribution and training. A UK network of enthusiastic independent dealerships is being established, with almost 50 already signed up and more to come. No fewer than four new SMTC UK-designed MGs are expected within the next five years. An upper-medium- (Mondeo) sized car based on the existing Roewe 550 platform will roll off the old Rover 75 line at Longbridge in 2010, followed by a mid- (Focus) sized model, a supermini and an all-new replacement for the TF. MG is SAIC’s flagship brand for Europe and all the above will be assembled in the West Midlands in order to satisfy European quality expectations, although they will also be manufactured in China (where the bodyshells are made) and go on sale first in that fast-expanding, right-hand-drive market; for the next five years at least there are no plans to import finished cars from China to the West. After the UK and Eire, MG has its sights set on Germany, France, Italy and Spain; it has US ambitions only for the first of the brand-new models. Will all this come to pass? Notwithstanding NAC’s £50 million investment at Longbridge, the development of a mass-market car usually costs something like £5 billion, against which SAIC’s UK investment of tens of millions on a project-by-project basis seems minuscule. SAIC’s investment in China is much greater, of course, and the British operation can probably survive and prosper for as long as its design and engineering skills are still seen as crucial by the Anglophiliac Chinese. Even when amalgamated at Longbridge, the MG workforce will number a few hundreds rather than thousands – small comfort to the 6,000 MG Rover workers who lost their jobs three years ago and remain understandably bitter about their fate, but surely better than nothing. Much depends on satisfying the customer. MG retains an enviable heritage and reputation among its devotees worldwide, but it’s important that the new cars live up to expectations. With the revitalised TF, the omens are generally good. The first 500 are being sold in LE500 limited-edition form, equipped as standard with what were previously optional extras – leather upholstery, piano-black trim, sports seats, detachable hardtop, MP3 audio, air-conditioning, parking sensors and so on, plus a numbered plaque and certificate – but all TFs feature a number of significant revisions.